Hampi is only 12 km by road after reaching Hospet by train. Buses are available from Hospet. Otherwise auto runs directly from railway station. Hospet is a small town. Once crossed there starts the rural Deccan. Fields, open lands and sometimes some even smaller towns or villages. There is a beautiful canal on the way. Hampi is almost a small village now. While coming from Hospet, after crossing some archeological ruins only one can enter into the village. Hampi didn’t attract me at the first glance. I felt it too congested. Specially, in the foggy winter morning, when accommodation was also uncertain, it was feeling too uncomfortable. Well, we got the rooms. A village home is converted somehow to satisfy the foreigners. Thus the houses are ok type. There are many such houses turned into hotels. Where we stayed, the seat out of that house is converted into restaurant. In the outer compartment, there is cemented bench and table with two chairs. Inner compartment has two mattresses on the floor as seating arrangements and a table is made using empty cold drink crates. Tea, minimum some tiffin and some items of daily use are available here. The most attractive matter is in these chiller items, there are some leaflets of Karnataka Tourism and some old books. After asking on the last day we came to know that the books are for sale, but the leaflets are free of cost. We took one for each. The owner even gave two posters from Karnataka Tourism even we never asked. Unexpected. To see Hampi, the Bengali folks can use an advantage of the novel “Tungbhadrar Tire” by Sharadindu Bandyopadhyay. The story of the then life could be cross checked once in Hampi. has seen the temples is south India properly, Virupaksha won’t bring much new things to them. Still two things are amazing. First, composite pillars of Vijayanagara. One single pillar is cut from a stone in fashion that it seems it is made by joining several pillars together. The second one is the paintings on the ceiling. Vegetable dye had been used, till date, the colors are prominent. The strange thing is, there is a three dimension effect in the paintings, which makes it more lively. It is difficult to understand from Virupaksha that Tungbhadra is flowing at very near vicinity. There is a way to go to the river from the temple. After reaching the river, it is required to understand the river and its relation with Hampi before starting seeing Hampi. Mainly on one bank of Tungabhadra is Hampi. As the river took its path, Hampi also spread itself accordingly. Route to see Hampi should be decided standing on the river bank after seeing Virupaksha. One can start through the river, otherwise they can return and start from outside of the temple. Here I will say the way we roamed. The temples is Vijayanagara have a sub-shrine other than the main shrine. Those kind of informative talks are not required here I feel. On the right of Virupaksha is Hemkut hill. We will go here later. The straight road is front of the temple is bazaar street. Both sides of the street have roofed corridor structures. Those used to be shops, now only skeletons are remaining. But if doors, windows and other decorations are imagined on those skeletons, it is possible to visualize the shape of a happening market. Karnataka state government craft shop is now there in one of the shops. Items are nothing special in that shop, but a shop in such an old hall itself is an attractive matter. In another similar room, there is a photo exhibition and yet in another, Hampi police station. We were not lucky enough to see inside of the last one. After crossing the bazaar street the road on the left hand goes to Vitthala temple along the river bank. We thought of going toward Matanga hill first. From bazaar itself after climbing up some stairs there is the Nandi shrine. From here right hand road has gone inside the hills. Similar to the other hills in Hampi, this hill is also a dry one of giant boulders. The only vegetation on the hill is infrequent huge bushes of cacti. The way is sometimes staircases, sometimes mud road or sometimes through the sheet rocks. Some small temples, Mandapas are there on the side of this way. The path ends at the side door of Achyutaraya temple. These stone mandapas might have been used by the commoners, as the front road of Achyutaraya temple is a huge one and known as courtesans’ street. Then it is expected that the ceremonial visits to the temple used to happen through that main road only. The way through the hill must be for commoners only. Considering the fame of Vijayanagara, perhaps, the present day mud way used to be stone laid at that time. But the natural pathways through the sheet rocks might not have been changed. Little climbing down is required to reach Achyutaraya temple. Actually on one side of the hill is bazaar street and on the other side it is Achyutaraya temple. To come to the temple through main road, one has to encircle the hill. Beside the temple there are villages. Lots of banana trees are there over there. From hilltop, looking below is the temple—up to this it is a stony landscape. Next is a little patchwork of greens, after that again stony hills. One of reasons for liking this temple is mostly people don’t come over here. Perhaps, because it is not easily accessible. One can sit here comfortably. While sitting here it is good to see the map and try to find out the exact present location. While facing the temple, the peak of Matanga hill is visible atop the right side Gopura. It seems almost as natural Gopura. As mentioned previously, the courtesans’ street is just outside of the Achyutaraya temple. There are some visible differences between courtesans’ street and the bazaar street. Apparently, both the streets are wide enough and have roofed corridors on both sides. The first difference that catches the eye is the pillars. The pillars in the bazaar street are normal stone pillars, but the pillars in courtesans’ street are having fine works on stones. The next difference that appears is on the side of this street there is a water tank, quite ornamented. From the street, this tank is behind the corridors of the street. The adjacent corridor of this tank is having even more ornamentation. Point to be mentioned here is, there is no such tank near the bazaar street. Virupaksha temple has its own tank. There is Tungabhadra also, as the bazaar street runs along the bank of the river. For courtesans’ street, this may be stated that as it is away from the river and there is no tank in Achyutaraya temple, so a tank was required to be here. In this regard, the presence of another tank at the outer end of the street is to be observed. This one is bigger than the other one, but less ornamented. So, one can assume that the water required to serve a mass of people could be fetched from this tank. Then, the other smaller but more beautiful tank might have been required mainly to serve the luxury purposes! This difference shows where decoration plays a vital role and where things are more materialistic. Maybe, the outer bigger tank used to be used by the people with comparatively less money, who could not afford the luxury of the center of the street. So, for peripherals, quantity matters, whereas for center what really matters is quality. From Achyutaraya temple the way directly goes to Vitthala temple. Well, direct does not mean nearby. Quite a long distance it is. If the craze does not push from within, the walk becomes tiresome. On this way there is the Varaha temple. After a little walk through this way there is another temple on a hillock of sheet rocks. There we went and got the way to Vitthala temple. After crossing this sheet rock, some part of the path is mud path. Here also we saw Mandapa beside the road. This seems the resting place or water vending spot meant for the commoners. After this mud road there is again way through sheet rocks. Here we saw worshipping figurines of duo are carved on the rock under our feet itself. But there is no rituals related to these. This way just touched Tungabhadra at one of its sharp turn and went straight. The road ends at a big gateway. After entering through this gateway, there is the king’s balance, Vishnu temple etc. Vitthala temple complex is at the end of this area. To enter inside one has to get ticket from local ASI counter. The king’s balance before entering into Vitthal temple appears at the first glance as a very high, but not much wide gateway. Close observation reveals there are three stone loops on the top horizontal slab of the structure, two on both sides and one in middle. Through these loops, the balance plates and needle used to be attached. Using this balance, possibly the kings and noble men used to donate things as per their body weights. Vitthala temple is one of the signatures of Hampi for today’s tourists. There are reasons for this. 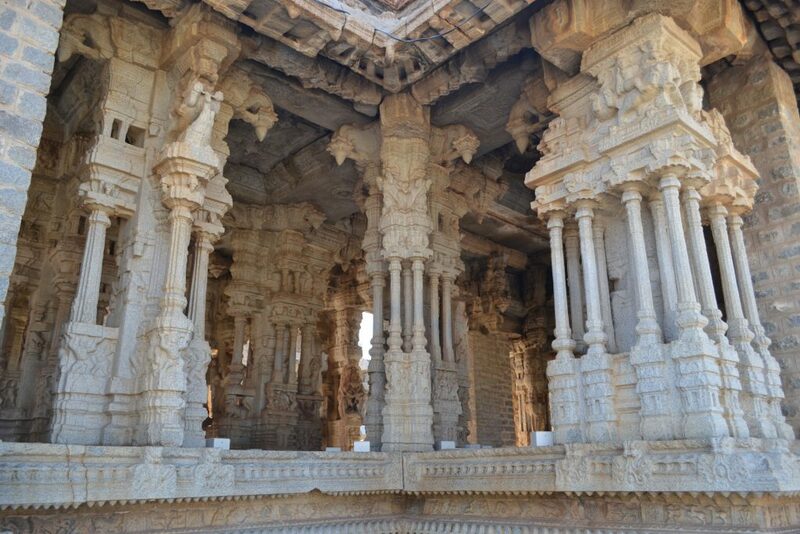 Here only, in Vitthala temple Mandapas, there are musical pillars. Different pillar plays a different note. An alley encircles the sanctum sanctorum. Two doorways with staircases are there on both sides of the yard in front of the sanctum. Through any of these two one can climb down, take a round and climb up back through the other one. Apparently it seems it is an underground chamber, but actually it is not so. The sanctum is built on a high platform. From there if one climbs down, they reach on the ground, but not underground. The specialty of this alley is its darkness. After crossing the first turn itself, it is totally dark. Nothing is visible. Then from guide books we came to know that this area might have been used as treasury. But I can’t reject the doubt of secret killings here. With this darkness I was surprised, but till then had no idea that grandpa of this is still there. The famous stone chariot of Hampi is in Vitthala temple only. The work on it is awesome. The wheels of the chariot are not fixed with the shaft, but loosely put. The bottoms of wheels are cemented; otherwise possibly it could have been dragged also. There is even a stone staircase to climb on the chariot. Like Tajmahal, miniature of this chariot also can be created for selling. But we didn’t see that anywhere. Maybe, that is not at all feasible. Or maybe, the effort to make Hampi popular forcibly has not started yet. After coming out of Vitthala temple, there was almost no hope that we will be able to reach our hotel. Because map was showing that we have come a long way from there. Everybody was terribly tired also and the sun was shining too hard. After enquiring we came to know that if we can walk for half an hour, we can reach the bazaar. Otherwise, we have to walk around 1 km up to parking and from there we can get auto which will cost us Rs. 300. We decided to walk. From the map and from the view of Gopura of Virupaksha temple it was understood that we had to walk along Tungabhadra. Doubt was, does that way exist at all. Then while walking we saw that we were walking through the ancient path itself. On the stones on river bank, again there are carvings. While walking through the bank of the Tungabhadra, one can see the boulder hills on the other bank. Huge gigantic boulders are the characteristics of Hampi. The hills over here give the feeling that these boulders are balanced together so finely that any minute disturbance could cause them to roll down at any time! Through the sheet rock way we walked, there also boulders are there. Some such boulders have built a natural obstruction between the river front and Hampi. But this cluster of boulders was not impenetrable. So through the natural gap among them and by increasing that gap with manual efforts, a narrow, stone laid pathway could be built. Where these boulders are meeting, the height of the roof is so low that one has to lower their head while passing. As this pathway is almost covered with stones, it remains comfortably cool even during the hot sun of noon. This one is one of the ancient pathways. There are some restaurants over here on the river bank. They take a lot of time to prepare the food. We took a late lunch in one of these and started coming back. We came back to the known area at the bottom of Matanga hill on the bazaar street. Then straight hotel we went. We had a huge plan that we will restart roaming after an hour’s nap. But finally we could get up in evening only. Well, we started roaming through the souvenir shops in the village. We did some shopping too. Next is dinner. We just took a chance and entered in a restaurant. We were surprised. The front yard of the house has been converted into restaurant. Through the wall on one side there is cemented wide bench. On that itself low height cemented tables. Mattresses are spread on the bench to sit and two chairs are provided on the other side. Strange system. Here also they take a lot of time to serve. But it is delicious to sit over there. After a good dinner, there was a good sleep. Next day after breakfast, the first thing we did was hiring bikes. Three bikes. We crossed Hemakuta hill, Krishna temple, Lakshmi-Narasimha, Badavilinga etc. and took the first stop at underground Shiva temple from where the ruins along the mud road start. There was water accumulated in the sanctum, so we walked through walls. The way this temple is, it seems, it was not at all underground. It appeared little down during excavation. The water inside seems rain water. There are algae and guppies in the water, but strangely, no mosquito. Along the mud road from this temple most of the ruins of Hampi are situated. Some areas are mentioned as Mohameddans’ quarters. Some ruins over here are of Islamic architecture. Among these, one is called mosque, but it is not facing the west, so actually it was something else. This quarter is mainly on the name of Ahmed Khan. On the other side of the road of Mohameddans’ quarters, the quarter is for noble men. House bases were excavated across a vast area here. Later we came to know that stone used to be used for making base of the house, and wood and plaster were used for the upper storey. From the top of a small hillock here, the bases are better visible. The panorama of Vijayanagara is also very beautiful from here. Whatever we saw on the previous day, some of them could be traced out from here. Something very nice happened atop this hillock. There was almost no network for my mobile since reaching Hampi. But from this hillock top, full network came suddenly. Actually Hampi is secured at three sides from outside world by hills; that is clearly understood by this incidence. There are many other ruins throughout the road. We went straightly to Hazara-Rama temple. There are not one thousand Rama idols over here, actually parts of Ramayana are carved on the walls of the temple. On the outer wall there are scenes of soldiers on elephants, horses or on foot, and there were scenes of dancers also. Other than human or animal figures, there are plenty of designs carved on the temple walls. From these designs, it is clearly understood that all the designs of Indian ornaments have come from these temple designs only. However modern the design may be, the origin is this, nothing new. It is surprising to realize that the maximum skill was achieved that time itself. After that no betterment could have been done. Actually, technology cannot change the basic feelings of human beings. There is no Gopura in Hazara-Rama temple. This shows that this temple is older than the Gopura culture. There is a market in front of the temple. Only few are remaining now. Normally market names don’t carry the temple name, same here, the name of this market is Pan Supari Bazaar. From Hazara-Rama temple we went toward Zenana enclosure on the left, instead of going to the ruins on the right. Here the second tickets counter of ASI. If it is visited on the same day of visiting Vitthala temple, then with the same ticket one can enter. It’s a big, walled enclosure. On the just left after entering are the female guards’ quarters. But recent study suggests that this could be the treasury. A small museum is held inside at present. After that the base of queen’s palace is there. But not only base, the entire ground floor almost is there as a big platform, as a symbol of past glorious palace. Beside the palace there is a water tank. Backside of the palace there is a watch tower. It seems it is not allowed for public to enter inside. On the right side of the way after crossing queen’s palace is lotus mahal. It’s a two storied, multi domed, plaster structure. Altogether it gives the shape of a lotus flower. There are no walls, so no doors or windows. The roof is based on the ornamented pillars. Here also the base is made of stone whereas the top parts are built by bricks. The plain plaster walls had been painted elaborately. After these, there is another wall and beyond that lays an open ground. Elephants stable are situated there. There is doubt about this stable; it might have been the office of the king’s clerks. On the other side of the ground there is a guards’ quarter. The small inner courtyard of this building might have been used for wrestling. Farther backside of the establishment, there are small temples, gateways, water tanks etc. Those were maybe for less aristocrat people. It was too late by then. So we proceeded to Kamalapuram for lunch. Here also, the outer room of the house has been converted into restaurant. The arrangement is very basic, but food quality is good. From Kamalapuram, toward opposite of Hampi, there are Bhima’s gate, Pattabhirama temple etc. We had not gone that way, but taken the way return. On this way, there is another ground with some ruins in it. The first ruin is Chandrashekhara temple. Here for the first time we saw that the ceiling and floor are wet. Possibly rain water is being accumulated on the roof and other corners and soaking through the walls. Here black stone pillars are there. From here while going farther in the ground, there is the octagonal bath. It has a roofed corridor and a fountain base in the middle of it. Probably this also was for commoners, as there is no palace in near vicinity. Near octagonal bath there is a way with low stone walls on both sides. Maybe this way leads to the Bhojanashala. Anyway we didn’t go that way. From the vicinity of octagonal bath and Bhojanashala, it feels that these structures were meant for some kind of wayside rest house. Somewhere in between the bath and the temple there is Saraswati temple on some rough boulders. The top of the sanctum is broken in such a way that sunlight directly falls on the idol stand. Well there is no idol at present. If one sits at the bottom of Chandrashekhara temple or doors of the Saraswati temple, they can see a vast open land in front. The winter breeze was whining. It feels very strange. The good thing is, most of the people don’t come here. One can relish the loneliness. Again, this loneliness is not really loneliness. All the times the ancient habitat surrounds. The ancient people come carrying their times. I never felt the song “Vaishnava jana” such appropriate with any other situation before. Again we started in search of ancients. Now we reached at queens’ bath. The structure is of Islamic style. Ornate arched corridors and balconies are surrounding the central square tank. But the entire thing is somehow not matching with Vijayanagara sensation. It was clear that by then outsiders started getting in the depth of the dynasty. The pure Vijayanagara was struggling for its identity. The last ruins on the mud road are the royal enclosure. This walled enclosure is the biggest enclosure among Hampi ruins. After entering, the first thing that attracts is Mahanavami Dibba, a huge, high stone platform. The king’s family used to enjoy the festival processions on the front road from here. Strange enough, that road is still there. Then it might be of stone, now it is mud road, but it exists. Entire royal enclosure is now visible from Mahanavami Dibba. There are two staircases to climb up the platform. One is steep and open. The other one is covered with arches and ornate. This difference possibly was meant to show the level aristocracy between the other noble men and the king’s family. Scenes of processions, hunting, dance etc. are carved on the walls of the platform. At a little distance from the platform is the overhead water channel. Water used to be flown through this channel from a lake at a distance of 3 km to fill the tanks of the royal enclosure. The first outlet of this channel is connected to the stepped tank. Made of black stone, this tank has a typical design in its own. The location of this tank does not suggest it used to be used for bathing; chance is there that this used to be used for the water sports of the kings. There are many house bases in the royal enclosure. By seeing the sewage and path system of some areas, it seems those used to be markets. Others are palaces, offices etc. Among all these, there is an underground chamber. The roof is broken now, so one can see the chamber from top. There is a staircase to climb down. It is clear that there could not be any natural light inside the chamber at any time of the day. But this is not strange enough. There are two doors on both sides of this chamber. They are connected by a narrow alley. One can enter into the alley through one door and come out through the other after encircling the chamber. The entire structure is made of dark green chlorite stone. After entering the alley only it is understood what darkness means. Daylight is there outside, but inside it is solid black. There is almost no information on this chamber. Maybe it was treasury. But nobody can guarantee that this chamber was not being used for trapping and killing enemies of any kind. Outside of royal enclosure, two big stone doors are kept. This is too much paranormal. Now is the time to return. Lakshmi-Narasimha and Badavilinga came on the way return. Both are giant monoliths. The Narasimha is no more intact. Still whatever is remaining is enough for awe-inspiring. The base of the Badavilinga is submerged in water permanently. Badavilinga has a story associated to it. Once upon a time, an old village woman, Badavi, had got a pebble Shivalinga on the way to her village home. She decided to take it home for worship. She tied the pebble in her cloth for carrying. On the way, at the same spot of today’s temple, the pebble fell down without the knowledge of Badavi. Then on, the pebble started growing at its place and took the size and shape of today’s monolith. The monolith got its name from the name of the woman Badavi. In a place like Hampi, facts, stories and myths are inseparable from each other. Depending on the circumstances and audience, each telling gets its characteristics. The temple of Badavilinga is a simple one. This is second biggest Shivalinga in south India. Biggest one is the Tanjavur Brihadeshwara. Incidentally, both I have visited. Well, the story of Badavilinga has two sides. First one is spiritual. God Shiva grew in size, grew from a pebble of size that could be tied in the corner of an old woman’s cloth to a monolith of almost 3 m height, still it did not overtake Tanjore Brihadeshwara. So our god himself shows us the greatness of being happy with smaller things and not being the best one. The other side of this story is political. The sculptor of this monolith somehow didn’t get the kingly patron. Maybe, his work had never been accepted, or perhaps, he was afraid to disclose his work. Considering the Muslim invasion, sculpting a Hindu god might have become risky. There may be another reason other than all these. If the dates and sculptor histories of nearby Lakshmi-Narasimha monolith can be compared with that of Badavilinga, it may come out that, actually the sculptor(s) practiced with Badavilinga before starting the far more complex Lakshmi-Narasimha. Or, same matter in a little different way, before starting the complex work as Lakshmi-Narasimha, the sculptor wished to please his guardian deity, Shiva. Both the statues are situated at the entry point of a village. In decreasing day-light, they are too beautiful and once again, paranormal. Once again we passed through the way in front of Krishna temple now in this evening. Now we cannot roam in the ruins any more. So we took a ride on the way toward Hospet. We went up to just before the congestion of the town starts and then came back. In midway, when a car coming from Hampi asked us the way to Hospet, and we, the experienced people of two days, told them the way, it was feeling like the olden days are becoming alive once again. New people are asking the ways from them who had already travelled in the same ways. On the previous day morning we came through this way. Then it was different. Now, after the dark of night has descended, the same road looks different. One strange matter, this much dark it was, still I could not see any fire flies. The plan to ride bikes on this road was really a good one. It was feeling amazing while driving. After returning to hotel, we sat for some time and gossiped. Then again we were in the village market, again some shopping, and much more window shopping, and finally reaching to the same restaurant and same table as previous day for dinner. Then back to hotel and gossip and discussion on strange matters in bed after switching off the lights, and then finally a warm sleep. We had to rush in the morning as that was our day of leaving Hampi by noon time. We had to vacate the room in the morning itself. Before leaving Hampi we had to see Hemakuta hill, till then that remained untouched. In the back room of the restaurant of the same hotel we left our baggage and started the roaming of the day. Hemakuta is just beside Virupaksha temple. Many small mandapas and temples are there. Possibly most of these are jain structures. In the novel ‘Tungabhadrar tire’ this hill is mentioned. It was said there that in that dynasty time, fire used to be lit atop Hemakuta, to show the direction of Vijayanagara to the travelers in night. This hill is also a hill of boulders and sheet rocks. Here one can find the Sasivekalu and Kadalekalu Ganesha images. The meanings of the names of these Ganeshas are based on their shapes. Sasivekalu means mustard seed and Kadalekalu means Bengal gram. Their shrines are simple. Both the images are monoliths. Kadalekalu Ganesh image has suffered some breakage in the front part. After climbing down from Hemakuta and facing Hospet, on left side road there is Krishna temple, the last destination of our Hampi tour. Crossing a random ancient market area below Hemakuta we reached at Krishna temple. The deity here used to be Bala Krishna. The temple is not gigantically big, but very well decorated. One can keep on sitting on the mandapas, or doors, or staircases. It feels good. It is said that this temple was built in memory of Kalinga war. Well, we could not know the result of that war. Battle scene has been made on the main gateway by plaster work. Elephants, horses and many soldiers are all shown in a congested fashion. Their faces, uniform everything is down with good details. They might be Vijayanagara soldiers, or maybe Kalinga soldiers. They are all same crowd when they are commoners. As usual there is a market in front of the temple. But this market has got the name as of the temple name itself—Shri Krishna bazaar. Almost nothing is remaining here also. The common people in Hampi are good. The souvenirs available here for tourists are much costly. But the items of daily use are affordable. People are very much hospitable. It feels that they are all still carrying the olden days’ traditions. The first drawn back feeling that came just after arriving here changed into attraction for this place. The market in Hampi is very interesting. Well, here I am mentioning the market of souvenir shops and restaurants. Souvenirs are mostly handicraft items. Every shop is actually ground floor or facing room of a residence of the village, mostly a small room with an opening through a veranda. So, the market area is not confined in one place, it is spread across the village. Most of the items are very costly as they are mainly meant for the foreign tourists. But some scope of bargaining is always there. It’s a pleasure to roam through these shops, both if you purchase or you don’t. Restaurants are also part of residential houses only. Some of them are having lodging facility in the house. All serve food at a very leisurely pace, so don’t get into one of these with totally empty stomach. You can always take some biscuits before getting in for main food and make yourself able to enjoy the ambience they provide to you. We visited Hampi at the peak of tourist season. The crowd mainly goes to Virupaksha, Vitthala, Hemakuta, Krishna, Zenana enclosure etc. The next crowd pullers are royal enclosure, queen’s bath etc. Other small places, that are scattered all around are very rarely visited by tourists. But there only lies the real Vijayanagara. Foreigners flock this areas somehow more than Indians. Hampi must have to be revisited.